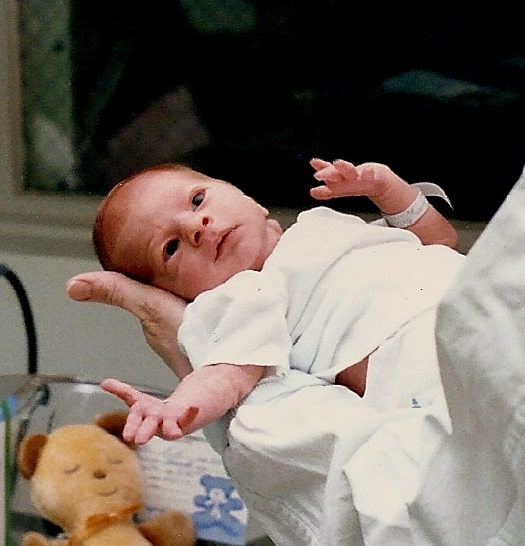 Twenty-six years ago, this little peanut came into the world. Edward James arrived earlier than expected and was a tiny 4 lbs., 3 oz. Eddie is my first nephew (four nephews and four nieces, combined, followed) and today is his birthday, so I am thinking about him and wishing him a Happy 26th! I am also reflecting on how this little one did not stay little – anything but. Today he looks like a football player, tall and wide and strong as anything. Looking at this photo, who would have guessed? In the photo, it is his Grandmaman (grandmother) who is holding him, her hand and arm supporting his delicate little head and body. Today he dwarfs Grandmaman, and could easily support her if she needed him to. I am proud of Edward, and the young man that he has become. I don’t see him often enough, but when I do, I see someone who is continuing to develop into a mature and responsible person. Edward has faced many challenges growing up, yet I see him continuing to find his way, and I am proud of him for that. I am also very happy to say that he and his sweetheart, Katelyn, are now engaged to be married. My baby nephew has grown up! Edward, I wish you a very happy birthday, and want you to know that you will always be one of my favorites! Sounds like he is lucky to have you. Aww, thanks! I have such a great family, we are all lucky to have each other. 🙂 I don’t get to see Eddie much these days (I think that happens when kids grow up and start to take their own path), but I am grateful for all the times I got to spend with him when he was a child. He put a lot of smiles on my face.